Delicious, creamy, all-American coleslaw – shredded cabbage tossed with a homemade, tangy sweet-tart dressing. Concord’s Coleslaw Mix makes coleslaw quick and easy. 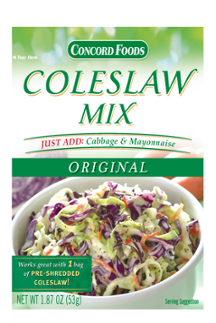 Add one head of cabbage (approximately 1-1/2 lbs) and one cup of mayonnaise to Concord’s 2.5oz package of Coleslaw Mix.